The Sacred Heart University Polling Institute polled 800 Americans in late November and early December, 2007. 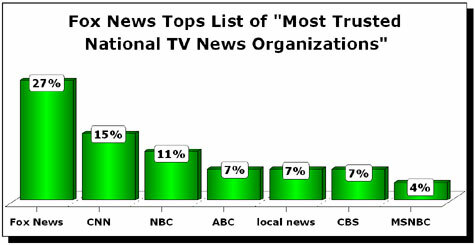 The results, released early in January 2008, showed further deterioration in the percentage of Americans who trust the news media, while the percentage who saw a liberal bias vastly outnumbered those who thought the media tilt to the right. Fewer than one in five Americans (19.6%) said 'they believe all or most news media reporting. This is down from 27.4% in 2003.' Nearly one out of four Americans (23.9%) said 'they believe little or none' of what they see in the news.